Providing you the best range of hex cylindrical standoff insulator and cylindrical standoff insulator with effective & timely delivery. With the constant support of our team of experts, we are engaged in offering a wide range of Hex Cylindrical Standoff Insulator. These are made out of high quality DMC & Brass inserts that are procured form reliable vendors of the industry. Our highly experienced and skillful workers make use of the latest tools and machinery to manufacture these products. The entire range is offered as per the application needs of our clients. 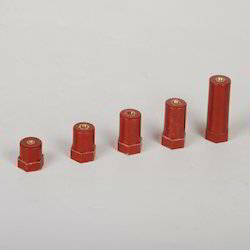 Our esteemed clients can avail form us a wide range of Cylindrical Standoff Insulator. These high performing cylindrical standoff insulators are designed and manufactured from superior grade of DMC. Thus, these products are appreciated for their good Mechanical & Electrical strength. Our specially designed Hex. Brass inserts are used for better performance at high Torque.